The statement, a vaguely worded five paragraph denunciation of Democratic policies (and proposed policies) is unremarkable — as are the authors, a collection of reliably conservative policy makers and commentators whose support for Donald Trump and tirades against the Obama Administration appear with some regularity in the media. What is remarkable, however, is that while the group states its opposition to Hillary Clinton’s economic agenda, it can’t bring itself to endorse Donald Trump or his economic platform. What makes this situation even more remarkable is that the mailing address of Economists Concerned by Hillary Clinton’s Economic Agenda is 725 5th Avenue in New York. Don’t bother looking it up—that’s the address of Trump Tower. Why is a letter denouncing Clinton’s economic agenda without explicitly endorsing Trump’s emanating from Trump Tower? My interpretation is that the drafters of the anti-Clinton statement, who are receiving at least some financial or logistical support from Trump, decided that it would be impossible to get a substantial number of economists to admit that they are backing Trump in the upcoming election. So they did the next best thing and solicited signers for an anti-Clinton statement. This episode highlights the extent to which policy experts have shied away from backing Trump’s idiotic economic policy agenda. A recent Wall Street Journal poll of 45 economists who served under both Democratic and Republican presidents on the White House Council of Economic Advisors could not find a single Republican appointee who would admit to supporting Trump’s economic agenda. Indeed, conservative academic heavy-weights like Harvard economics professors Martin Feldstein and Greg Mankiw, who would normally support the Republican nominee, have announced their opposition to Trump. Voters should be reminded by economic experts that Donald Trump’s economic agenda is a recipe for disaster. Opposition to Trump is not limited to a few pointy-headed academic economists. The National Association of Business Economists’ asked its — presumably business friendly — members this summer “Which candidate would do the best job as president of managing the economy?” Among the 400-plus economists who responded, Clinton was supported by 55%, while Trump was backed by only 14%. In fact, Trump came in fourth: he was outpolled by Libertarian Party candidate Gary Johnson and “don’t know/no opinion”— which both garnered 15%. According to recent polls, the presidential race is still close, suggesting that overwhelming expert opinion against Trump in economic, defense, and foreign affairs is not matched by the public at large. Voters either do not know or do not care what the experts think. Support for Donald Trump is particularly strong among what the media calls “angry white men,” blue collar Americans who feel that societal and economic trends during the last few decades have left them behind. If these media reports are accurate, then Trump’s promises to upend the established political order — and to disregard its experts — may well enhance his standing with this portion of the electorate. So should experts just shut up? Or redouble their efforts in the remaining month of the campaign? Ultimately, the decision on who will become the next president will not be made by experts, but by the voters on 8 November. But to help the voting public make their decision, experts should continue to offer their opinions during the remaining month of the campaign. Voters should be reminded—as often and forcefully as possible—by economic experts that Donald Trump’s economic agenda is a recipe for disaster: his plan would dramatically increase the government’s debt and budget deficit and start trade wars with China and Mexico that would cost millions of jobs. More frighteningly, military, defense, and foreign policy experts should continue to remind voters that Trump has asked why the US can’t use nuclear weapons if it has them. Until the voters make up their mind, I will remain one concerned economist. Featured image credit: Donald Trump with supporters by Gage Skidmore. CC-BY-SA-2.0 via Flickr. Richard S. Grossman is a Professor of Economics at Wesleyan University in Connecticut, USA and a visiting scholar at Harvard University’s Institute for Quantitative Social Science. 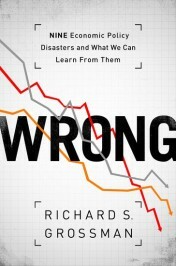 He is the author of WRONG: Nine Economic Policy Disasters and What We Can Learn from Them and co-editor of The Oxford Handbook of Banking and Financial History (2016). He blogs at UnsettledAccount and you can follow him on Twitter at @RSGrossman. You can also read his previous OUPblog posts.